Blarggs are large dinosaurs commonly found inhabiting pools of lava in underground caverns. 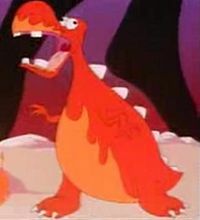 Blarggs resemble lazy-eyed lava dinosaurs, but Yoshi's Story depicts them as blob-like beings with large mouths, small arms and beady eyes, while numerous other games involve an assortment of similarly blob-like derived species. Blarggs first appear in Super Mario World as fairly rare enemies, encountered primarily in the Vanilla Dome. 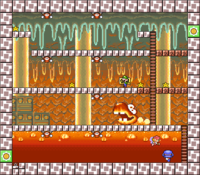 When Mario or Luigi approach a Blargg on a Lava Lift, the eyes of the Blargg will be visible before they dip back into the lava, moments before lunging. Yoshi is capable of jumping on them and, with some difficulty, eating them, the only way they can be defeated. The player can also opt to Spin Jump if lacking a Yoshi, although this method only prevents one from taking damage if landing on a Blargg or its eyes. They are mainly seen in Vanilla Dome 3, also making brief appearances in Vanilla Dome 1 and Chocolate Secret. Blarggs, though never referred to as such onscreen, appeared in two episodes of the Super Mario World animated series. In the episode "The Wheel Thing", Mario and Luigi, having been banned to the Lava Pits, begin attempting to cook a pizza over a fire. The smell from this cooking pizza causes a Blargg to emerge from a nearby lake of lava and begin to chase Luigi, attempting to eat the plumber. Luigi is rescued from being devoured as Mario swoops down and saves his brother as Cape Mario. In a later episode titled "Mama Luigi", a Blargg makes a brief appearance. 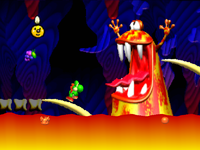 Luigi and Yoshi, while running away from a pair of Tyrannosaurus Rex, use a Blargg's head as a stepping stone to cross a river of lava. A Blargg, which lived in water, appears in one of the bad endings in Dinosaur Dilemma, eating Mario if he falls into a pit while fleeing from some Mega Moles. Several Blarggs make a minor appearance in Nintendo Power's Super Mario Adventures comic, appearing in the lava flooded basement of Bowser's Castle. These Blarggs are used as stepping stones by Mario to reach a Warp Pipe leading to another part of the castle. A Blargg appears in Honō no Dōkutsu, the fifth stage of Mario & Wario. It is nearly identical to its appearance in Super Mario World, but unlike its previous appearance, it is docile and merely part of the scenery. In Yoshi's Story, Blarggs are altered, being larger, and given small arms with a blob-like appearance. They appear in only one level, Stage 2-2: Blargg's Boiler. In this game, Blarggs don't harm Yoshi when touched, although Yoshi gets a forceful push from them. While they can't be harmed, Yoshi can throw an egg at one to force it back into the lava. There is also one Blargg unaffected by Eggs which will briefly pursue Yoshi. Due to their large size and blobbish appearance, these Blarggs appear to be visually based off of the Gargantua Blarggs in Super Mario World 2: Yoshi's Island. 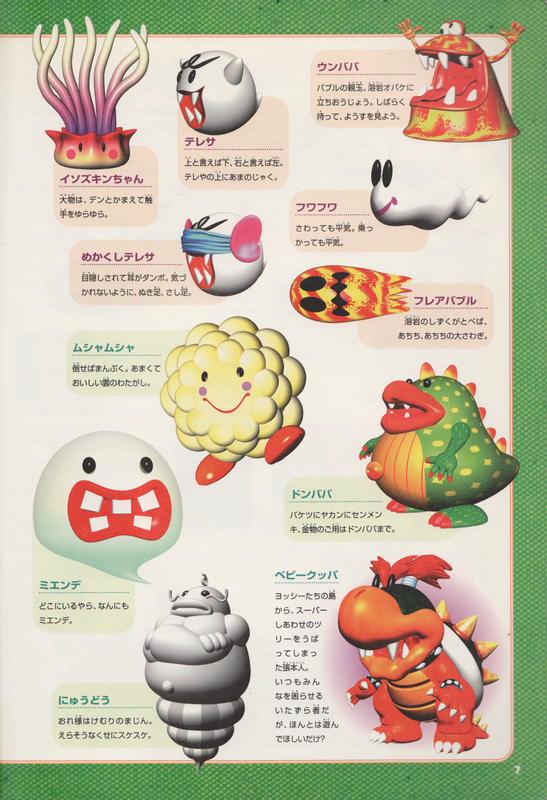 Blarggs, with their appearance resembling how they appeared in Super Mario World, were originally going to appear in Super Mario 64 as enemies in Lethal Lava Land, Bowser in the Fire Sea, and even Wing Mario Over the Rainbow as they were found in the game's coding. With GameShark codes, the player can make them appear on the level. No reason was given as to why the Blarggs were cut out of the code. Blarggs are also referenced in both Mario & Luigi: Partners in Time and Super Paper Mario. In the former, they are mentioned by Kylie Koopa, while in the latter, a Sammer Guy named Raging Blargg can be fought. A Blargg sticker can be collected in Super Smash Bros. Brawl, and a Blargg Spirit appears in Super Smash Bros. Ultimate. Both use their Yoshi's Story artwork. In addition, Czar Dragon, the lava-dwelling boss of Barrel Volcano in Super Mario RPG: Legend of the Seven Stars, resembles a Super Mario World Blargg. Unbaba No specific meaning; officially romanized as "Unbaba"
This page was last edited on April 9, 2019, at 14:31.